Construction of the Museum of Tadeusz Kantor has been going on for nearly a year now and is expected to be completed in 2012. The museum is to be sited around, and above, Podgórze’s old municipal power station on ul. Nadwiślańska. According to the architect’s plan for the museum, part of the exhibition space will be suspended 13 meters above the ground. Slabs of reinforced concrete will support an enclosed walkway above the museum’s courtyard. The museum’s unusual design reflects Kantor’s avant-garde work in stage design. The courtyard itself could be used as a play space for children when the museum is not open and could serve as an outdoor cinema or venue for concerts and theatrical performances. Architects nsMoonStudio say they will use natural and minimally processed material for the building. 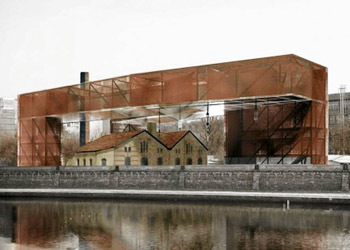 They won a public competition to design the museum in 2006. Tadeusz Kantor (1915–90) was a painter, stage designer, poet, and actor. He founded the Cricot 2 Theatre in 1955, in the cellars of the Krzystofory Gallery in Krakow. In 1980 he moved the Theatre from Krzysztofory to ul. Kanonicza. In the early years of the Theatre he produced performances based on his development as a painter. It was in the Cricot 2 Theatre, in 1975, that he produced his most famous work: The Dead Class. Kantor died in Krakow at the age of 75.